Bring My Food is Jackson Hole's premier food delivery service. Founded in 2016 out of the simple desire to connect Jackson Hole's amazing restaurants with people that want take-out but don't want to or can't go out. Whether you want Breakfast, Lunch or Dinner, simply place a take-out order from your favorite restaurant and Bring My Food will pick-up your order and deliver it to you at your home or office. Delivery is available in Jackson and surrounding areas, including Teton Village, Wilson, Victor, Alpine and Star Valley. 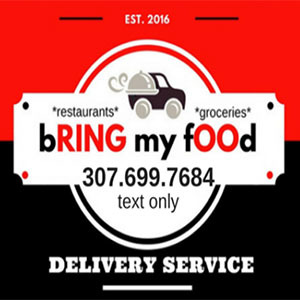 Bring My Food also delivers groceries and small packages per request. Text 307.699.7684 for details and pricing. Over the past 3 years Bring My Food has been an active supporter of Nourish the Children (NTC), a registered 501 (c)(3) charity. NTC is an initiative that applies business principles to address the problem of childhood hunger in a sustainable manner. The program begins with a highly nutritious food developed by Nu Skin’s nutritional scientists, known as VitaMeal. Effective January 2018 Bring My Food will be donating a portion of every delivery fee, up to $3 per order.